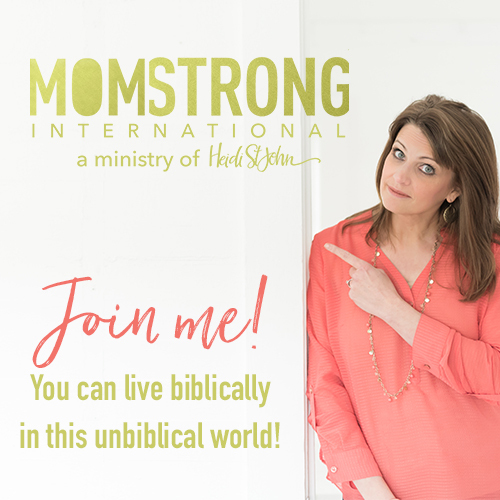 Are You Desperate for Discernment in Your Mothering? Part of being discerning is asking God for wisdom when it comes to choosing the battles we engage in. So how can we know the difference between a battle and a war? What’s worth fighting over? 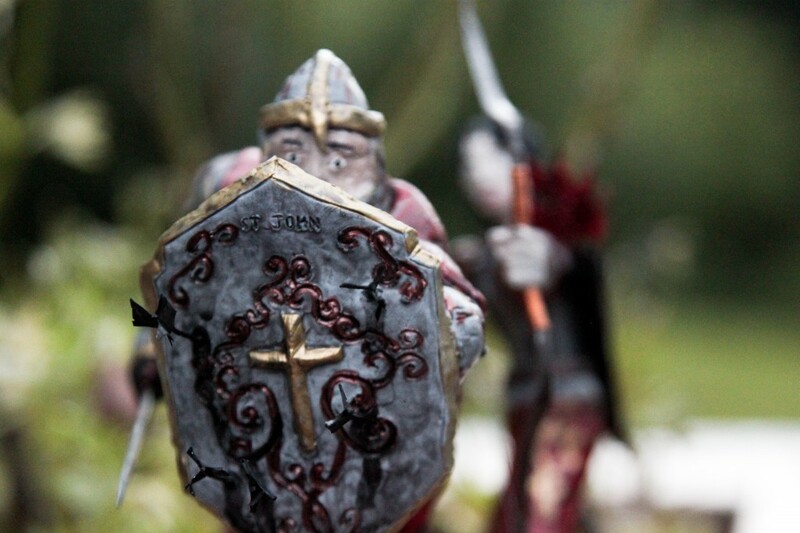 How do you choose your battles carefully? I wish I had a formula that I could write here for you. Honestly? It would sell more books! We would rather be told how to do something exactly right than take the time to listen for that “still small voice” most of the time. The truth is a lot harder than that. The truth is that the only way to know is walk in humble relationship with God. When it comes to our children, mothers need to be tight with the Lord. Every day, we need nothing short of divine wisdom to help us navigate the rough waters of the culture. We need wisdom to discern a foolish action of a child from a rebellious one. One is childish, the other is sinful. One is a skirmish, the other leads to war. Wise moms recognize their need for discernment, and they know where to find it. 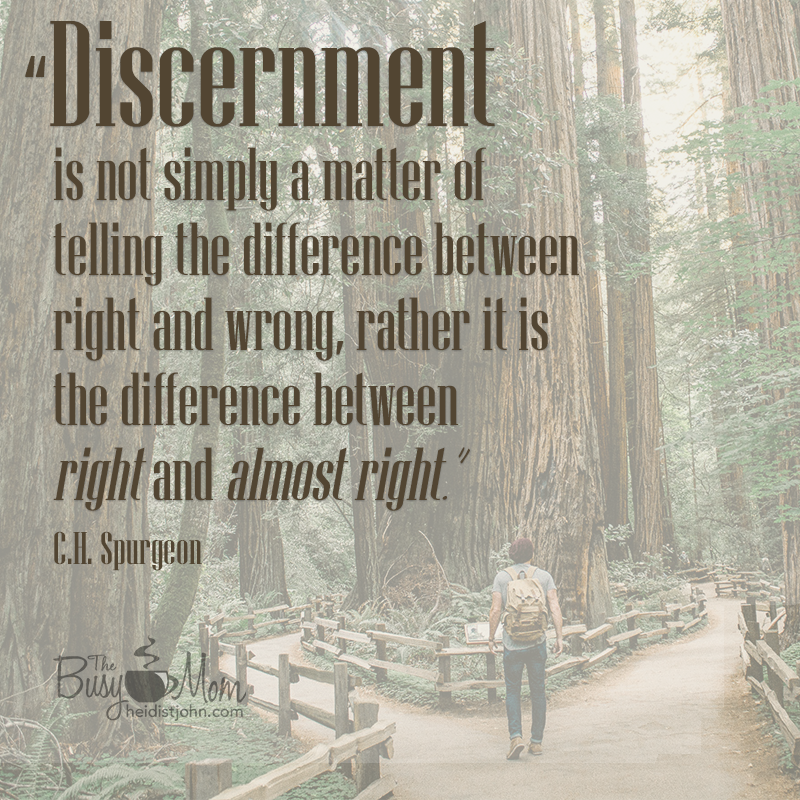 Discernment is not something we have apart from God; it is something we acquire as we walk closely with Him. If you’re in a struggle with one of your children, it’s time to get on your knees and ask God for wisdom and perspective for that child. God knows exactly what’s going on. He can give you the wisdom you need. Instead of facing all the challenges and changes of motherhood on our own, we have the Creator Himself walking alongside us. Want to know what battles are worth fighting? Ask Him. So, now it’s countdown time until we meet this little chub-a-lub of a miracle from God. Eight more weeks of my stomach growing even bigger (which is hard to imagine at this point)! Eight more weeks of using the excuse, “I’m pregnant and don’t feel like it.” 🙂 Eight more weeks of feeling those incredible flutters, kicks, wiggles, jabs, and hickups from a little person moving inside my body. Eight more weeks of drinking coffee with a guilty conscience because I know my midwife doesn’t approve. And, that’s not all she disapproves of! I love my midwife…I really do. Even though she makes me turn in a food log to her every visit and tells me all the things I shouldn’t be eating and drinking- I still love her unconditionally. Boy, she sure knows how to lay on the guilt too! Who knew that carrots and snow peas were not a good choice of veggies (too much sugar, she said). Why is juice bad for me? Again, too much sugar, she said. Why can’t I have Special K cereal for breakfast? It’s my favorite cereal. Oh right… too many carbs, not enough protein. What’s wrong with my ham and cheese sandwich for lunch? Full of nitrates if you didn’t get the meat cut from the deli, she said! In all fairness, her intentions are good for me. I know this. she just wants a healthy me, a healthy baby, and a healthy delivery. So, thank you Lord that my midwife wants the best for me. Thank you that she holds me accountable for what I eat and drink during my pregnancy, even though she drives me crazy with her do’s and don’ts. Isaiah 41:10 – So do not fear, for I am with you, do not be dismayed, for I am your God. I will strengthen you and help you, I will uphold you with my righteous right hand. Isaiah 40:31 – but those who hope in the Lord will renew their strength. They will soar on wings like eagles, they will run and not grow weary, they will walk and not faint. Proverbs 3:5-6 – Trust in the Lord with all your heart and lean not on your own understanding, in all your ways submit to him and he will make your paths straight. Joshua 1:9 – Have I not commanded you? Be strong and courageous. Do not be afraid, do not be discouraged, for the Lord your God will be with you wherever you go. There are many voices we hear during pregnancy. Advice coming from lots of well meaning people such as family, friends, midwives, doctors, and even strangers! But the most important voice we need to listen to is from the Holy Spirit. Keep your trust in Him. He is faithful. His love never ends, and His mercies are new every morning! This is one of my favorite verses from the book of Psalms. I’ve learned that whenever I see imagery used in Scripture, it’s time to pay close attention. God has something very important for me to take away from that image. The imagery here is a powerful reminder of a beautiful relationship. God gives children to us as “arrows” in the hands of a warrior. That makes you a warrior, busy mom! And you’re not just a run-of-the-mill warrior, either—you are an archer. You’re in the arrow-launching business! I love the imagery of this sculpture. It was made for me by the son of dear friends, and it illustrates the way we should see ourselves as parents: we’re launching our arrows for the Kingdom, aren’t we? Notice the way this couple is engaged in battle: the husband, in front of his wife, protecting her and shielding her from enemy arrows. His wife is not standing by passively, is she? No—because she is part of a team with her husband; a dynamic duo, if you will, for the Kingdom! 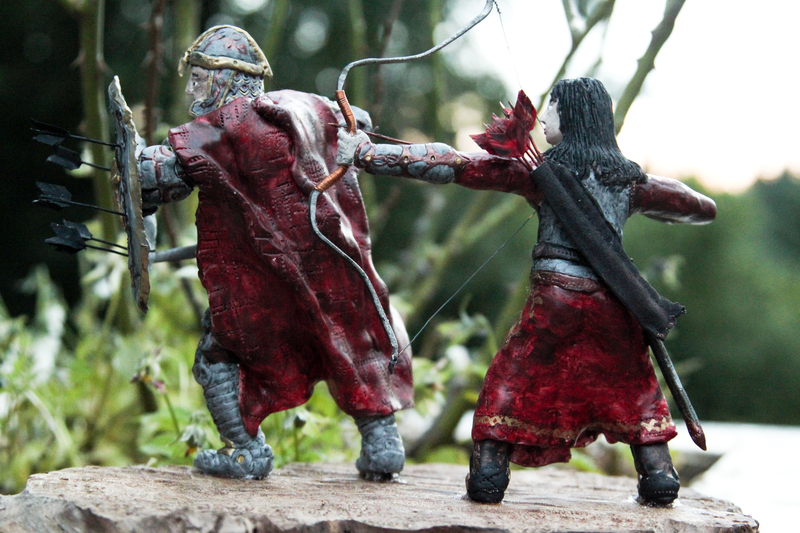 This woman is launching her arrows out into the world under the protection and covering of her shield-weilding husband. What a powerful image! So how do we launch our arrows? We are in is a spiritual battle. We can’t lose sight of this fact. When we do,we forget who the real enemy is. Our kids are not the enemy. Our husband is not the enemy. Satan is the enemy. And one of his prime targets is Christian families. Gird up! Be ready. Protect your marriage. Protect your family. A good marriage is a partnership—a dynamic duo for the Kingdom! The goal of Christian parenting is best achieved inside this amazing partnership. This means that nurturing our marriages is of primary importance! It’s not secondary to raising children—it’s essential to it. Seeing or marriages in light of eternity is a vision-sharpening experience, isn’t it? 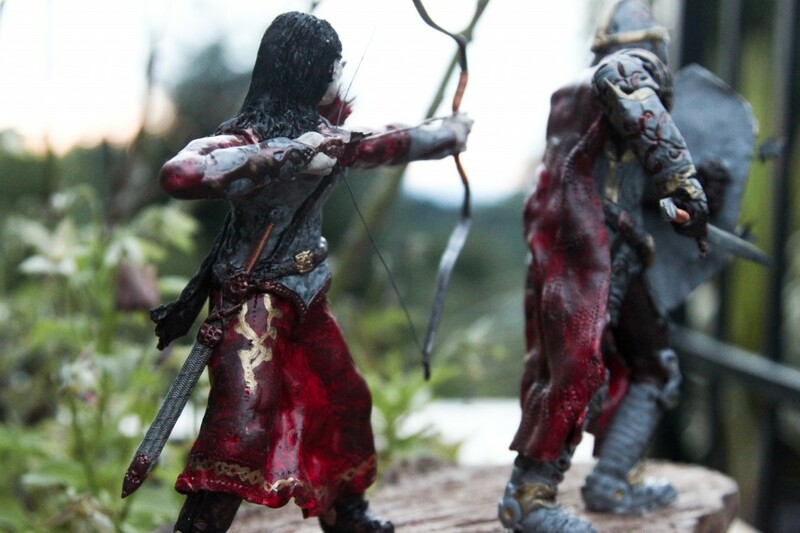 Are your ready to launch your arrows? We started our homeschool year last week. It went great. Then the crazies came to visit. Interruptions. Crisis. Family stuff. Business stuff. Something inside me knew it was coming. Every year it seems that something stops me from getting off to that great start that I’d dreamt of during those long uninterrupted periods of planning over the summer. And then it happens – friends begin sharing their awesome back-to-homeschool photos and experiences on my beloved Facebook page. This is when it starts to get ugly inside my head. Why, after 20 years of homeschooling can’t I figure this out? I encourage moms all summer long as a speaker at homeschool conventions! Shame on me! Guilt. Condemnation. Discouragement. I told you it was ugly. I head to the bathroom – many a busy mom’s prayer closet – and pour out my heart to God. He is the only one to go to. Only He knows why. There is no logical reason for my failure. I know how to plan and organize a homeschool. Only He has the answers for my aching heart. As usual – I felt the Lord’s peace and presence. There is no shame or condemnation here. I have peace, yet there is this part of me that hurts. That is when God reminds me that the pain I’m feeling is the idol I insist on making out of my kids’ education being torn down. God wants His best for me and my kids and that’s not going to happen if I insist on getting in the way. Coming from a long line of highly educated people, God knew my propensity for making academics an idol. He has blessed me with 7 kids with dyslexia to make sure that never happens. I still want to teach every thing. Teach it well. Finish every page. Have my kids get A’s on all the tests. And I still want my first week of school to go well. Is that too much to ask? God is telling me that my homeschool is for His glory not for mine. Honestly, looking back over my 20 years of homeschooling, I see so clearly that God has removed my signature from the lives of my kids. Sure I’ve loved them and fed them and done my best to faithfully shepherd them alongside my husband, but their successes are nothing about me – nothing but evidence of God’s amazing grace. Every year I try to pick up the reigns again and make homeschooling and parenting about me – about what I can give and do and create out of these kids. Freshly humbled, I am able, once again, to let go of my grip and let my ideals, my plans and my purposes go. It’s a little scary and exciting all at once. Shouldn’t that be how it is when we walk with the living God? If you are struggling with the back to school crazies, may I encourage you with the encouragement that I myself have received? The baby is the lesson. Most of my homeschooling days have been filled with babies and toddlers in arms and under foot. Even though my youngest is now five and a very enjoyable, mostly rational young fellow – I have grandkids! When the babies and toddlers are distracting you from your plans, remember that the baby is the lesson. Relax and enjoy them and show your older kids (who could otherwise be doing Math or English) that babies are a treasure. Show them how to love and enjoy that noisy, messy toddler. Mercy, kindness, compassion, service – that is the lesson for the day. It’s not about you. I know this is uncomfortable. Believe me. I know! Our homeschools are not for our glory. Look how quickly we finished our studies. Look at how well my kids did at the spelling bee. Look at all the great hands on projects we’ve completed. Although there is nothing wrong with these things, they are not why we homeschool. We homeschool to raise kids to love and serve God and each other. Academic pursuits must be second to spiritual tasks. God is faithful, Mama. If life is looking a little crazy today, step back and seek the One who has numbered your days. There is rest in knowing that He is perfectly aware of how much English you finished today and you are right where He wants you. And when others see your homeschool, though they don’t see a Pinterest perfect mama, they will see a family that is being perfected by what God is doing in their lives. With changes rapidly happening in our public school system, more parents than ever are considering the very viable option of homeschooling. 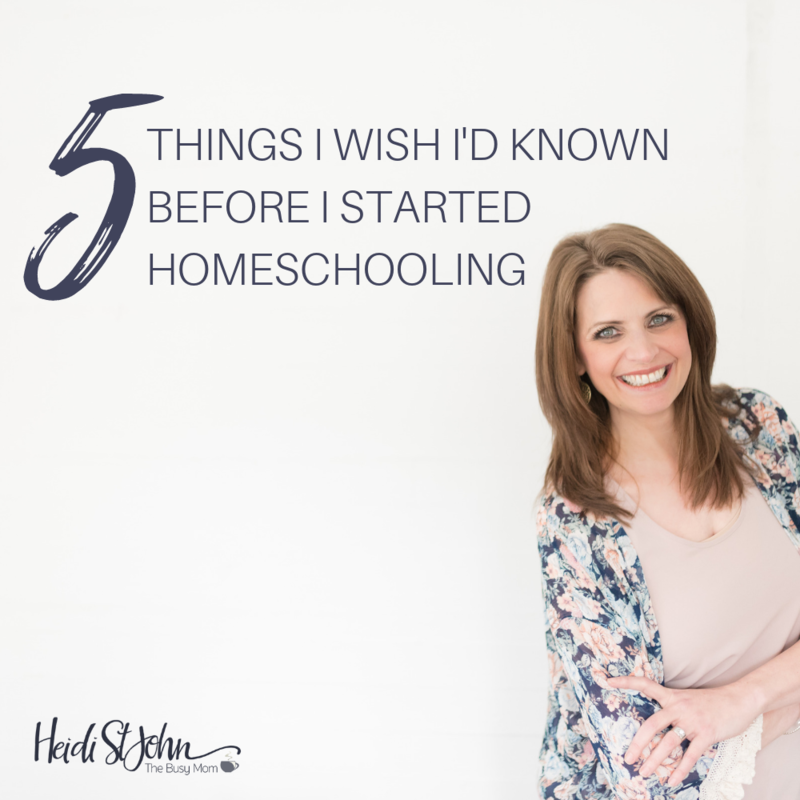 If you’re one of those, read on.I’ll never forget our first year of homeschooling.I sort of “fell” into homeschooling, and so, admittedly, I was not as well prepared as some of you dear readers will be. In fact, I was about as green as green could get—but I was trying—right down to the flag salute and scheduled recess time. Like many new homeschool moms, I was trying to imitate what I remembered about school. And the school that I attended as a child had a flag salute. So we did, too.As you are probably guessing, our first year was tricky. The neighbors thought we were crazy, my parents wondered out loud about my “ability” to teach our children, and I had no idea how to get dinner on the table and still teach math, reading, and science. Or, maybe I didn’t need to be teaching science to our second grader? The opinions on teaching science to second graders were mixed, after all.Can you relate? Oh, the things I worried about!I needed a class for homeschool rookies, but unfortunately, there were no such classes around. Homeschooling is the best decision we have ever made with regard to how we would educate our children. But I won’t lie to you—those first few years were especially challenging. If I could start again, I would do a few things differently. “A student is not above his teacher, but everyone who is fully trained will be like his teacher.” (Luke 6:40)Education is discipleship. This simple sentence has become the mission statement of our homeschool. The Lord has taught us the simple truth about education through homeschooling. And the truth is that ALL education can be summed up in one word: discipleship.Because the Bible tells us that students become like their teachers, we know that our children are modeling us in every area of life. Luke 6:40 bears special meaning for homeschooling parents. It reminds us that no matter who is teaching our children, they are being discipled; and it compels us to examine our own lives, because our children are very likely going to be just like we are.The culture we live in has made academics the “main thing,” but I beg to differ. Academics pale in comparison to teaching our children what it means to be men and women who are sold out for Jesus Christ, ready to give an answer for the Hope that lies within them. Education is simply the opportunity to shape the hearts and minds of our children. There can be no greater goal than to teach our children to follow hard after Christ. As a new homeschooler, I was bombarded with academic opportunities. Dozens of programs and curricula overwhelmed me at the homeschool conference. I studied my options, poring through homeschool catalogs and investigating different companies. Our coffee table overflowed with flyers and curriculum samples. If I could start over (which I can, each year, by the way! ), I would have spent more time praying and preparing for the manner in which I would be known for teaching our children, rather the method I chose. At the end of the day, my kids remember much more about how I taught them, rather that what I taught them. 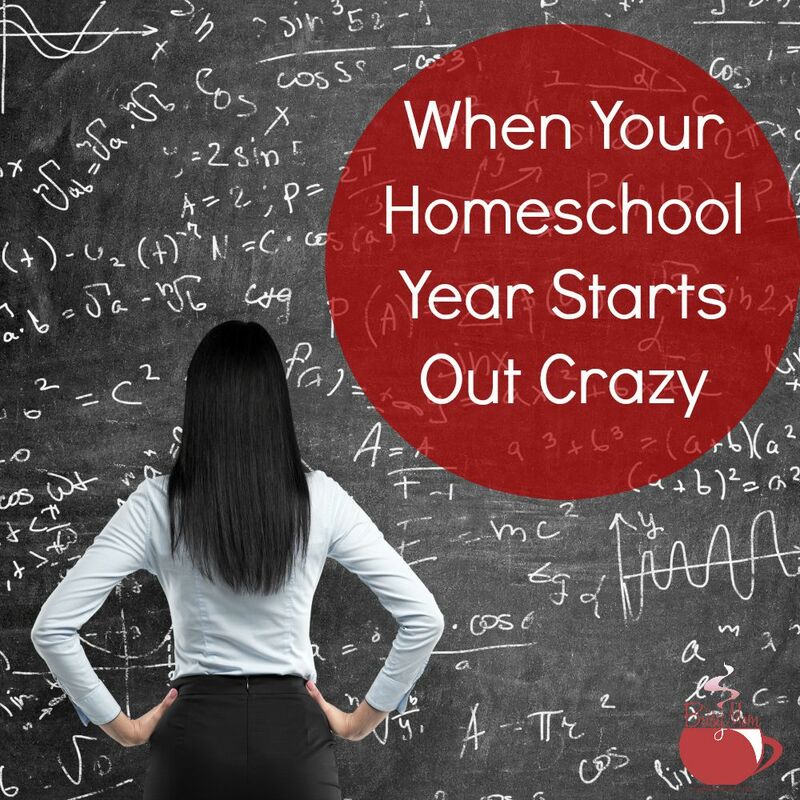 As you begin homeschooling, take some time to think about how you want your kids to remember their homeschool years. I have learned that the relationships I foster with my children are much more important than the books I choose. No one ever plants a fruit tree and expects mature fruit to appear overnight. Yet, for some reason, homeschool parents often feel pressure to “out-perform” in almost every area of parenting, even when children are very young! Your kids don’t need to be seen as geniuses. If your neighbors ask your fourth grader what the capital of Texas is and he answers “Oregon,” don’t panic! Remind yourself that good fruit takes time to grow. The results of good homeschooling take time to see. We can place undue pressure on ourselves and our children when we saddle ourselves with expectations that do not come from the Lord. See his expectations and live up to those. The rest either don’t matter, or will come in time. There will never be a teacher more devoted to the success of your child than you are. Is your child disobedient? Whining? Ungrateful? Rebellious? If so, then “real” school has begun. Training your child to be obedient is more important than teaching addition. Don’t be afraid to stop formal schooling to teach the greater lessons of life: obedience, respect, truthfulness, graciousness, and love. I have met many parents over the years who miss the true opportunity of homeschooling by focusing solely on academics. Their children suffer for it. The parents suffer too, but it’s usually later down the road. Consider Eli, who served as a priest in Israel. His unwillingness to discipline his sons brought dishonor to his family, and ultimately, grave punishment to his sons and himself. You will not have done your child any favors if he or she is fluent in three languages, but cannot speak a single one in a loving and respectful way. When we honor God’s ways first, the rest will follow. Take the time to discover both your primary learning style and the learning styles of your children. Moms who know their learning style have an easier time choosing curriculum and a far greater success rate in teaching their children the best way. Your preferred learning style will guide the way you learn, and it will greatly influence the way you teach! For example, I know that I am a visual learner. If I had taken the time to discover this earlier in my homeschooling, I would have avoided many of the curricula that I chose, because I would have known that I would probably not enjoy teaching it. • Visual (spatial): You prefer using pictures, images, and spatial understanding. • Verbal (linguistic): You prefer using words, both in speech and writing. • Physical (kinesthetic): You prefer using your body, hands, and sense of touch. • Logical (mathematical): You prefer using logic, reasoning, and systems. • Social (interpersonal): You prefer to learn in groups or with other people. • Solitary (intrapersonal): You prefer to work alone and use self-study. There are many books and websites dedicated to learning styles. Check them out! You’ll be glad you did. 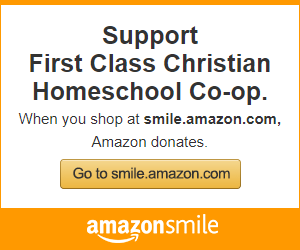 It’s been many years since I took my first steps as a new homeschool mom. Last month, we graduated our son, who never went to “regular” school. Like his two sisters before him, Skylar is ready. He graduated in June from our homeschool, and as he did, he was likely to catch a glimpse of two wide-eyed parents staring at him in a cap and gown … not because they couldn’t believe he graduated, but because they couldn’t believe it went by so fast. With four more children coming up, we are learning just how fast it goes—and how worth it the journey is. I remember before I had kids, I would watch misbehaved children and think, “MY kids will NOT act that way.” I had many theories about discipline and raising kids. Now I have eight kids and no theories. What I never factored into disciplining our kids was the deep love and attachment I would have for them. It never dawned on me that I would care if they liked me and I certainly didn’t plan that one minute they could turn my world upside down and make me crazy and the next minute become the cuddliest, cutest little human being EVER. Two of our kids are married with babies of their own and our third is a senior in college. We still have 4 teens in the house and a 10 year old, and with that comes some perspective (not to be confused with having all the answers). They still sometimes turn my world upside down…and then win my heart back in a split second with a simple gesture. I never imagined I could get so frustrated and angry and still love so deeply. The wildest roller coaster can’t even begin to compare to this ride of raising kids. In so many ways, I’m a very different mom than 24 years ago and, in hindsight, some of the hills I thought were worth dying on, weren’t. But the flip side is that I can see more clearly (than ever) the ones that are. I see the necessity for our kids to hear the truth about sin and our deep need for a Savior. I feel the urgency to make sure that I do everything I can to help them grasp the value of what Jesus did on the cross for us and understand how important it is to own their own relationship with Him. I want the Word of God to be what they filter EVERYTHING through: work, church, relationships, culture. God says that our children are like arrows. In order for an arrow to to fly so it won’t veer off in the wrong direction, it needs to be “true”. “True” as in straight. 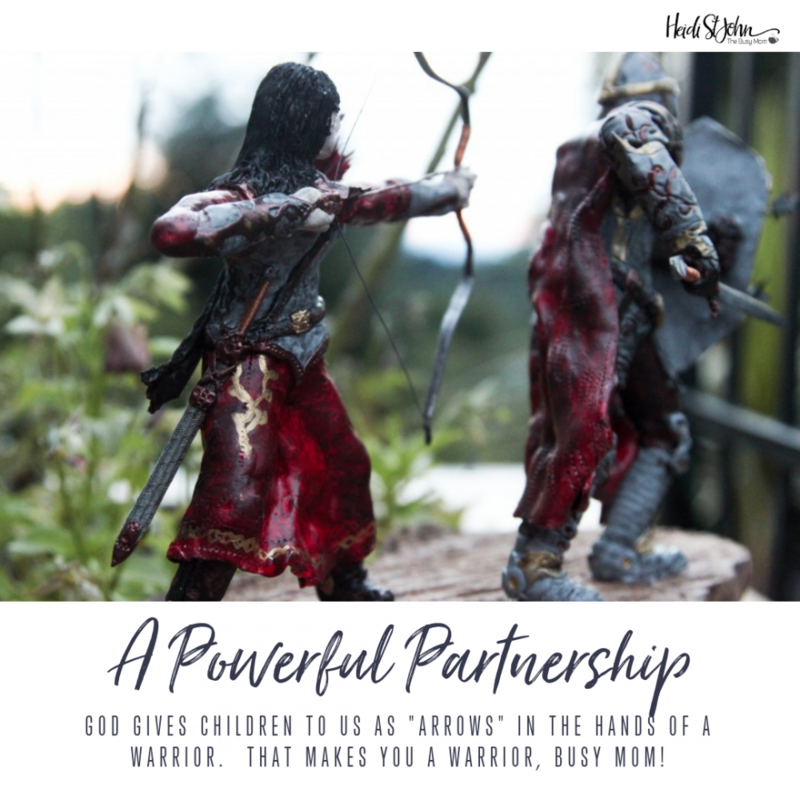 God also says that these children are like arrows IN THE HANDS OF A WARRIOR and anyone who has been a mom knows that motherhood is NOT for the faint hearted. 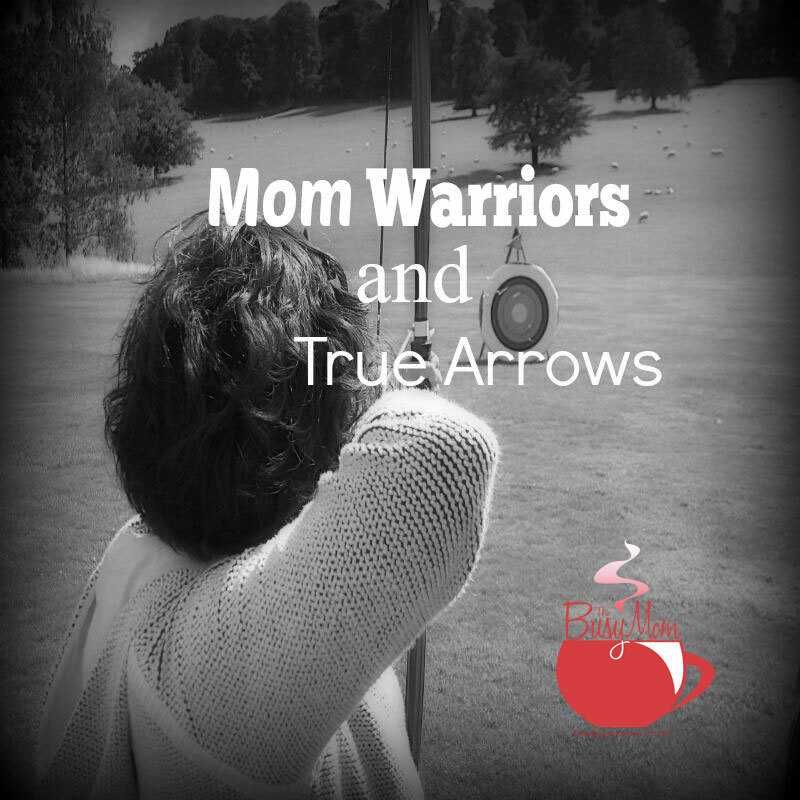 We are warriors…MOM WARRIORS. This means that we are in a battle, a battle with a very REAL enemy. He wants our children’s souls and we have to FIGHT for them. 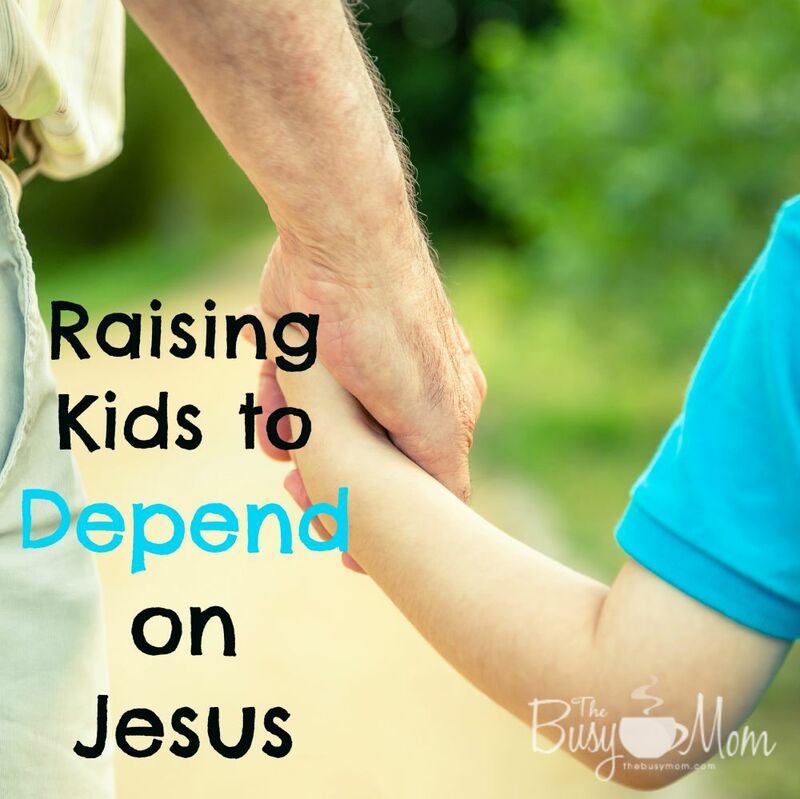 Our kids come into this world helpless, but also as sinners who need a Savior. They are crooked and by the grace of God, we fight to straighten them so that when these arrows are released by our bow, they fly “true” and straight and fulfill the purposes to which God has called them. We do this through training and discipline. Disciplining them for their good, out of love for them, out of a desire to help them avoid foolishness, which God says will lead to destruction and, instead, point them toward wisdom, which He says leads to life and blessings. So much of this is done by example, but above all it happens on our knees, because the truth is that the deep work that needs to happen in any of our hearts is only done by the power of the Holy Spirit. Ultimately only HE can turn our hearts toward Him and straighten what is crooked. No greater battles are fought than from the humble position of prayer, asking for God’s grace and mercy on our kids’ lives and for wisdom to raise “true” arrows.